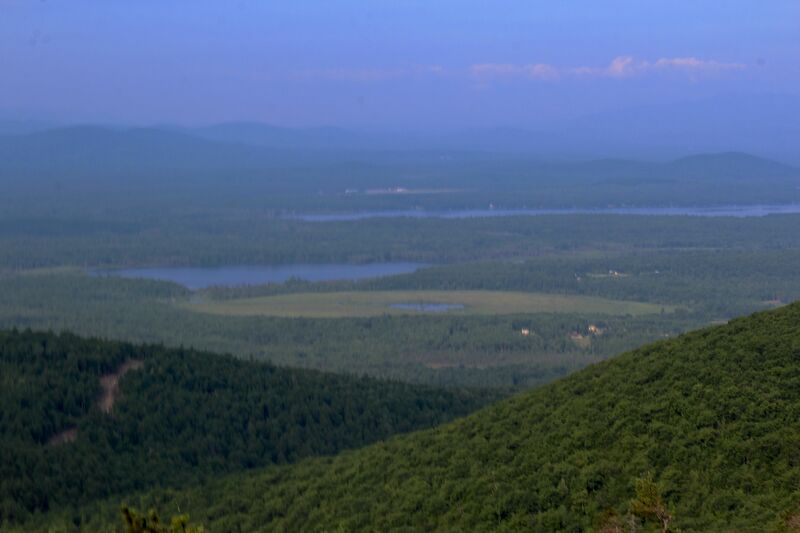 Each time we climb Pleasant Mountain, the view differs–and so it was this morning. Haze sugar coated the summits beyond. Green, blue, white, purple and gray melted into each other. 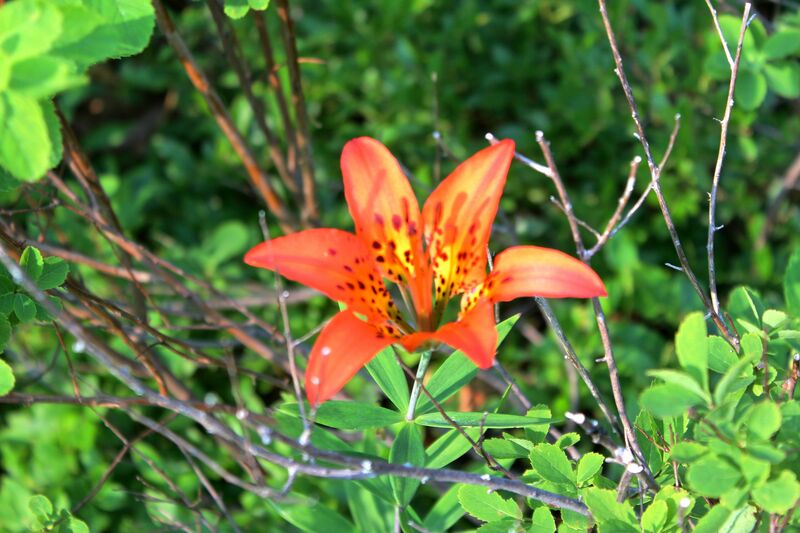 That’s what made a bright orange wood lily beside the trail stand out. Certainly a shock of color. Step in with me for a closer look. Three sepals and three petals, but their design is similar. Each is jazzed with dark purple to black spots–the better to draw in those butterflies and skippers. And white-tailed deer. The other thing to notice is how the sepals and petals taper at the base. I actually took this photo on Whiting Hill in Lovell about two weeks ago. But, I’m curious about its reproduction–one on Whiting, one on Pleasant. Am I missing something? Have the deer consumed others? I frequent both of these locations and have only seen the solo plants. I can’t sit still when I get home. Especially when I know I have work to do. So, I wandered around the backyard. Right off the deck, a quaking aspen grows on the edge of a flower garden. Daylilies surround a wooden barrel we turned into a water feature. Alas. They’ve been knocked down. The resident porcupine has been visiting on a regular basis. 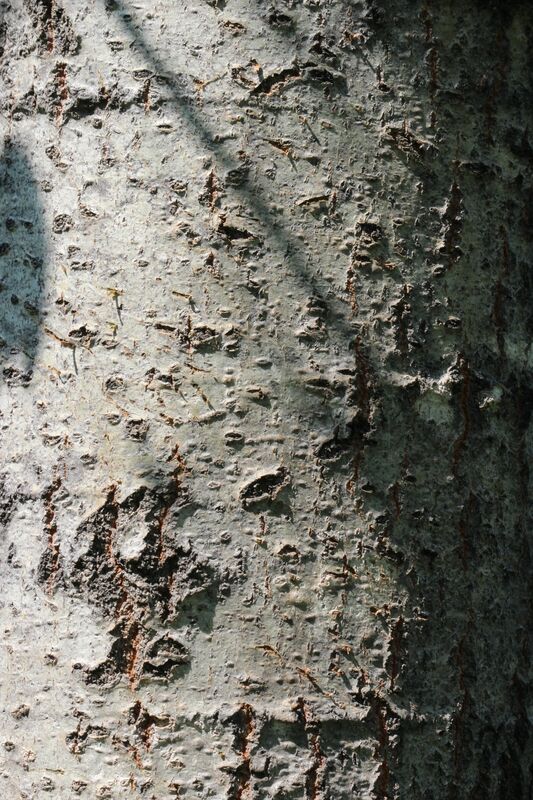 Quaking aspen bark features horizontal and vertical lines, but the porcupine left its own mark–look for the fainter diagonal lines created by its toe nails. The leaves must be delish. I wandered some more. 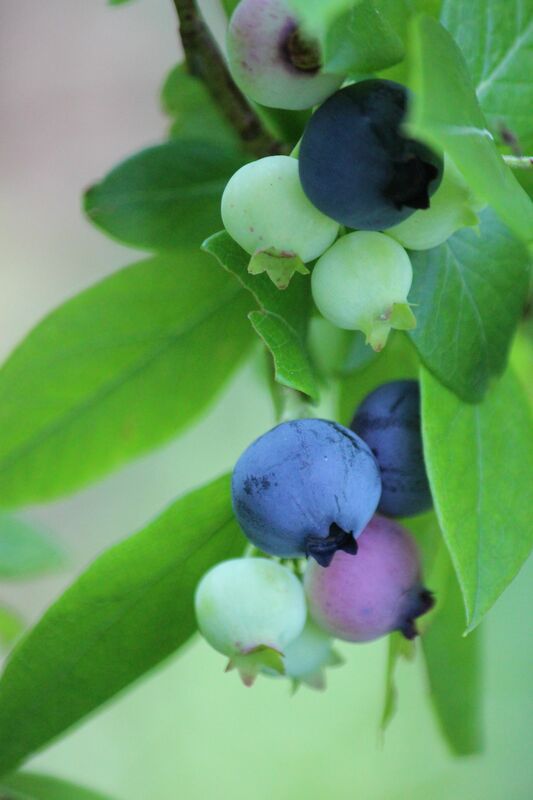 Certainly delish–blueberries. They need a wee bit more time. Not delish, but dramatic in shape and color is the bittersweet nightshade. 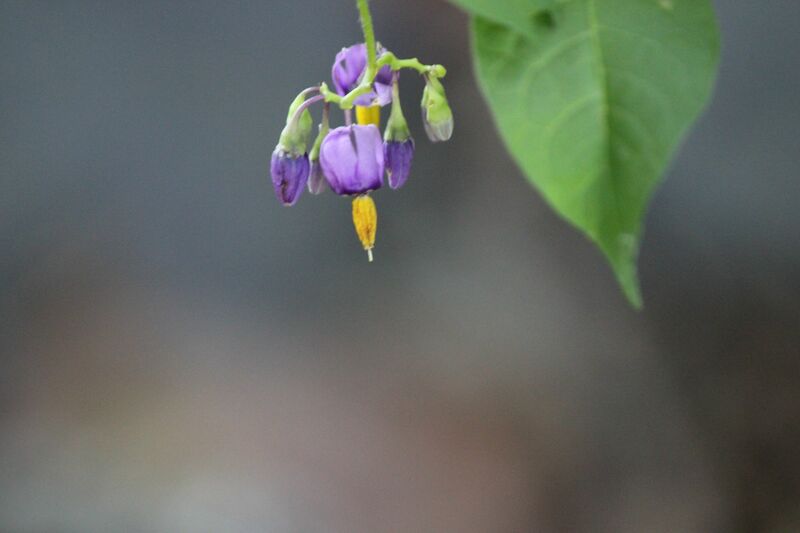 I remember my mother calling it deadly nightshade. 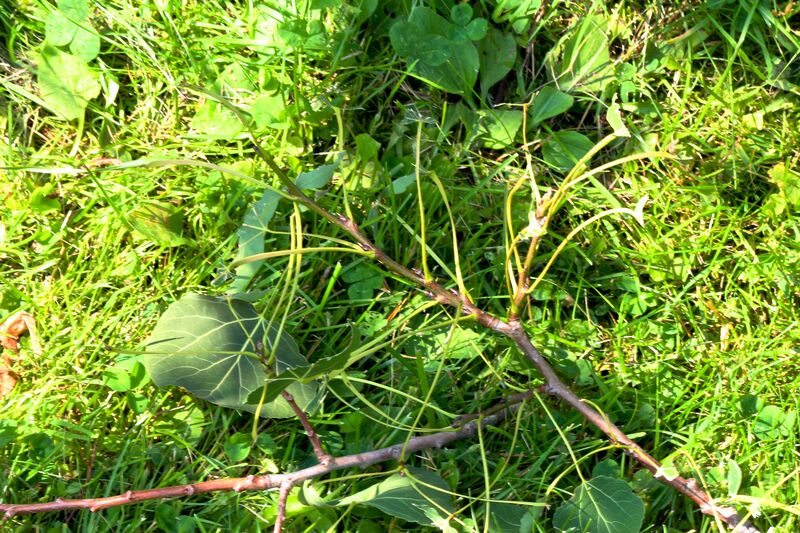 Its berries are poisonous, but unless eaten in large quantities, it isn’t fatal. OK, the point is–admire the flower; don’t eat the berries. 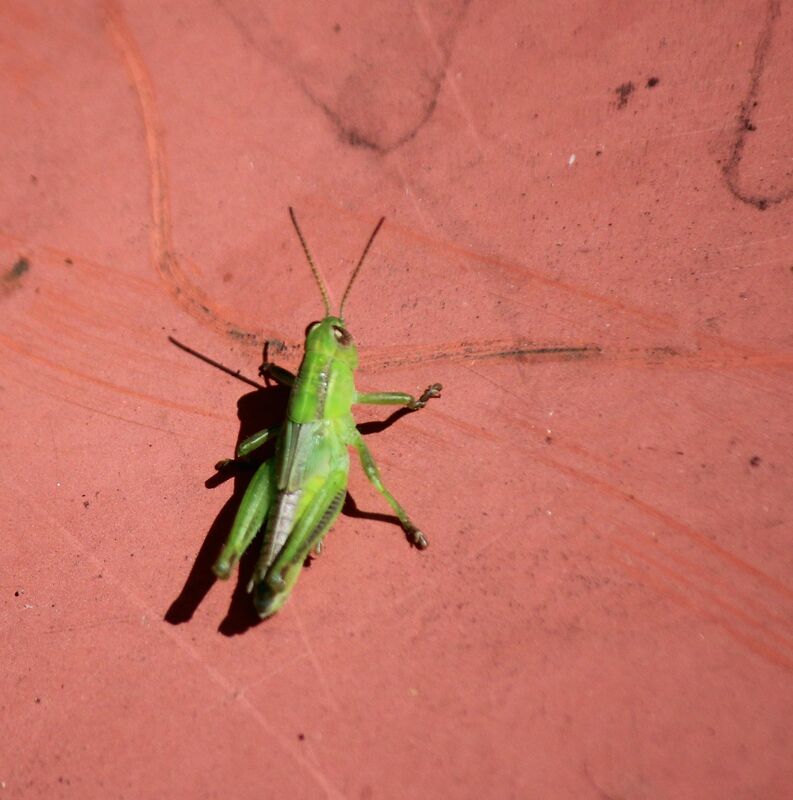 Not as dramatic because it wants to blend in is a grasshopper. Do you see it? A sibling was hardly invisible on the cellar door. 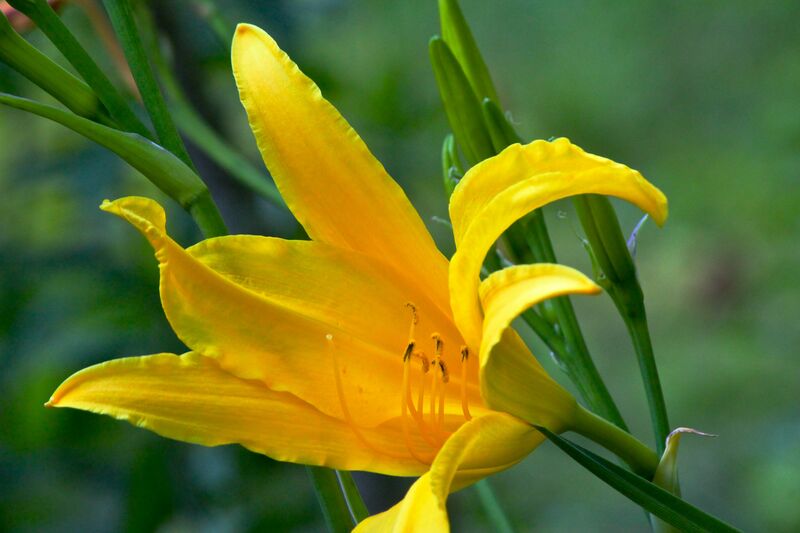 Before heading inside, I stepped into our neighbor’s yard because her yellow lilies are blooming. Ours will probably show forth their sunshiny faces tomorrow. I’ve a feeling that these are cultivated, but don’t know for sure. 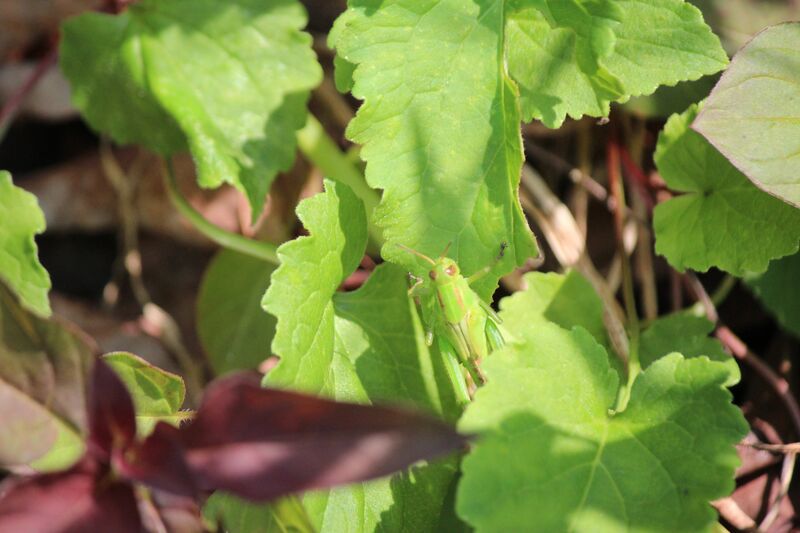 I’m hoping Bev Hendricks of DeerWood Farm and Gardens will enlighten me on this species. 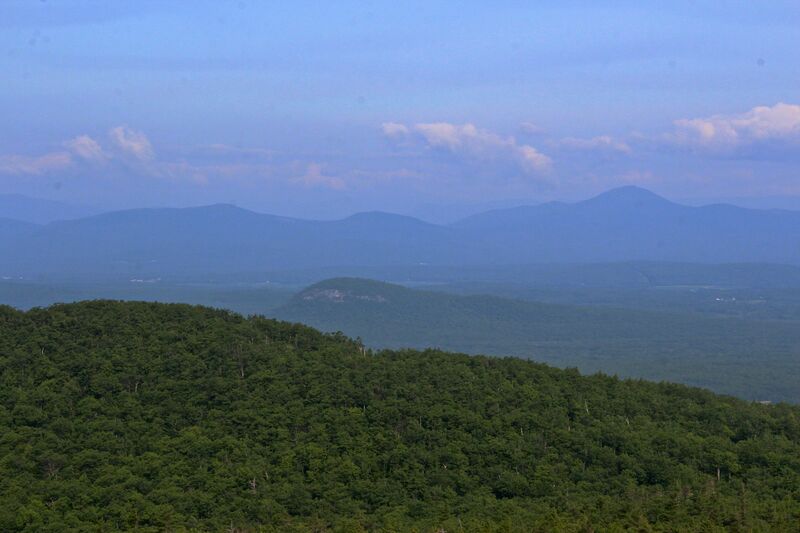 From a hazy summit view to brilliant natural hues, today was a day of contrasts. 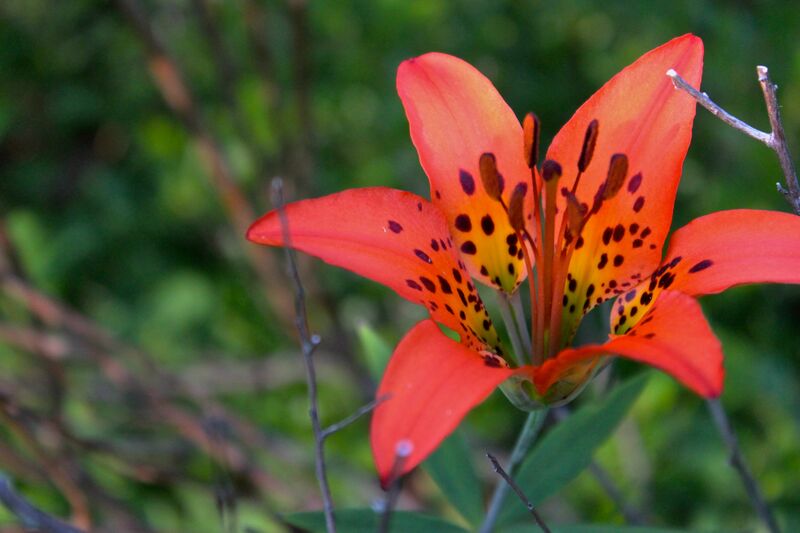 I love the wood lilies, maybe because we rarely see them, it makes them a treasure to find. 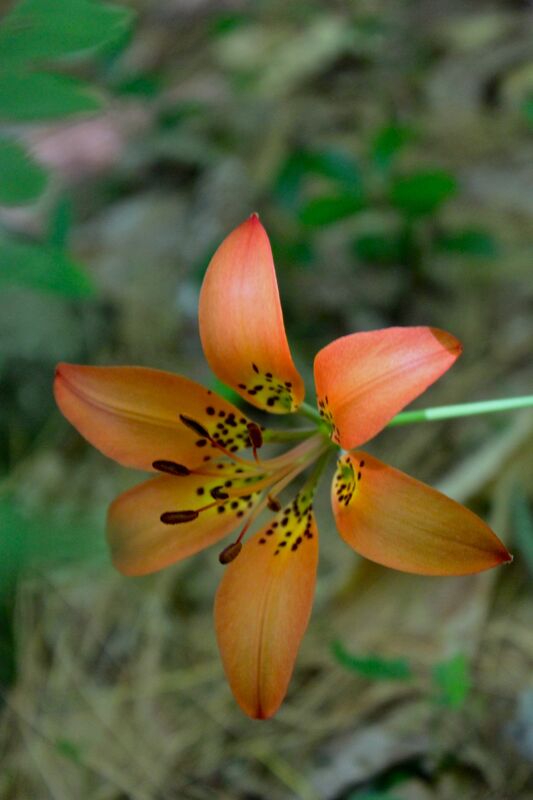 A few years ago, we spotted a single lily on a dirt road (path) around Hancock Pond. I’ve done a search for our photos of it, but that will be another day! Too many photo folders and thumb drives to look through! 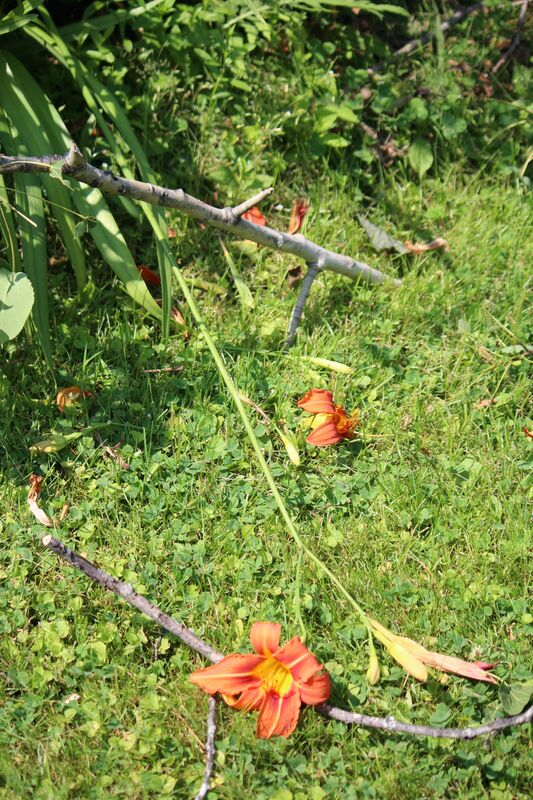 Any idea why it’s only a single flower at a time? Hmmm, a patch of them. I’m going in search of this. Thanks for telling me, Ursula.